Walkthrough of 94 Percent Game Answers to help you list the words from 2 questions or expressions and 1 photo image of 94% game cheats ! 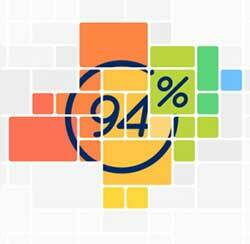 Play 94 percent app from Scimob, the creators of 94 Seconds and 94 Degrees trivia game ! This entry was posted in 94 percent game and tagged 94% Answers on March 4, 2015 by 100doorssolution.